at Calle Correo 51, one block from the center of town. Situated on a 6400 foot plateau in central Mexico, San Miguel de Allende does not have the beaches that most people imagine when thinking about Mexico. But it does have the constant hum, buzz and electric energy of creativity on just about every corner. It can be the creativity of a metal fabricator hammering out the next beautiful iron gate. Or it can be the lamp shade maker in the mercado piercing slotted patterns on shiny silver tin to create beautiful wall shadows. 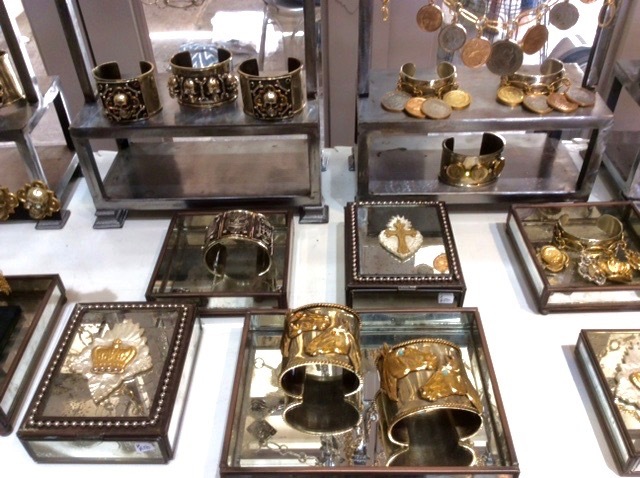 Or it can a stylish ex-pat gringa who is inspired by the local creativity to bring her own design visions to life. That's what interior designer Katherine Leutzinger did in 2004 when she was at a crossroads in her life and daringly decided to close her interior design business in Reno and move to San Miguel for a new start. 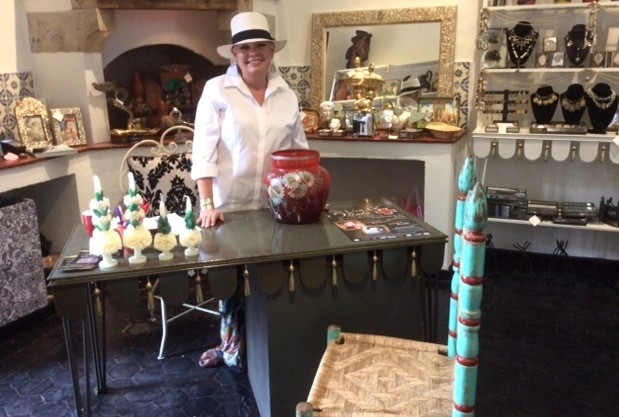 With her keen eye for drama and style, Katherine opened her elegant shop selling her jewelry, home decor and vintage Mexican items. Using rich Mexican imagery and icons such as crosses and crowns in her designs, each piece is handcrafted locally, making each piece not only a fabulous thing to wear, but also a meaningful travel memento. On every trip to San Miguel, I make it a point to visit Casa Katalina and spend time trying on Katherine's bracelets, earrings, rings, necklaces and I always find several items for myself and for gifts. 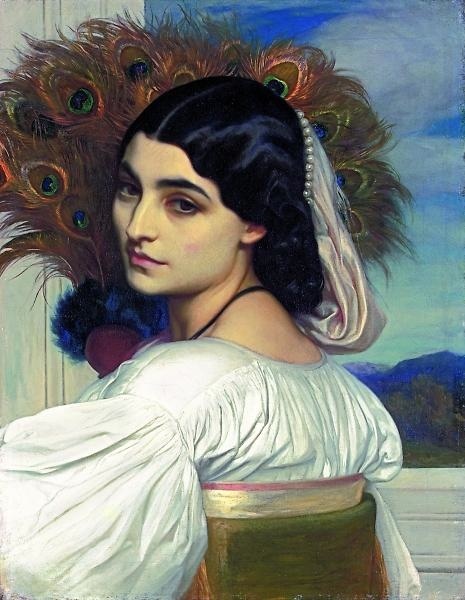 And while I'm trying things on, I love chatting with Katherine to learn about the latest great restaurant or fun thing to do. Made of the metal alloy, Tumbaga, each link on the chain is skillfully crafted by hand. 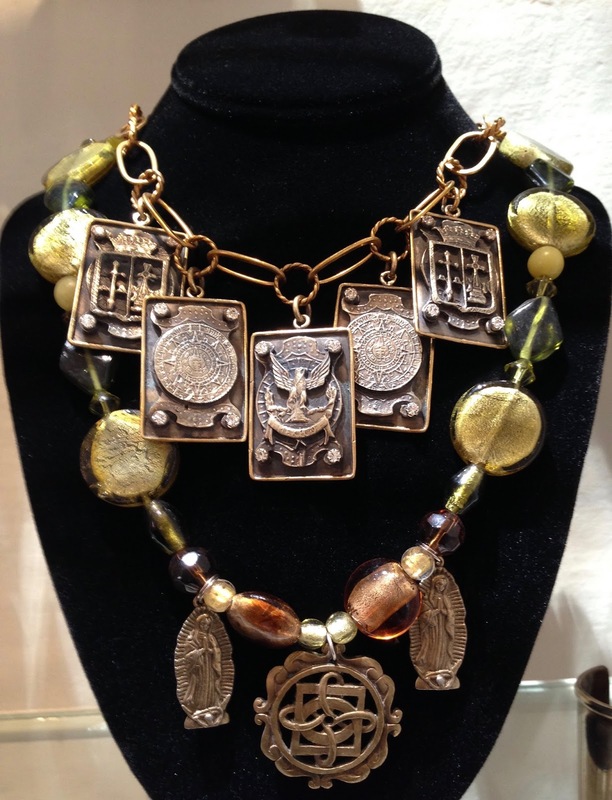 The large charms have images such as the Aztec calendar and the Mexican coat of arms. 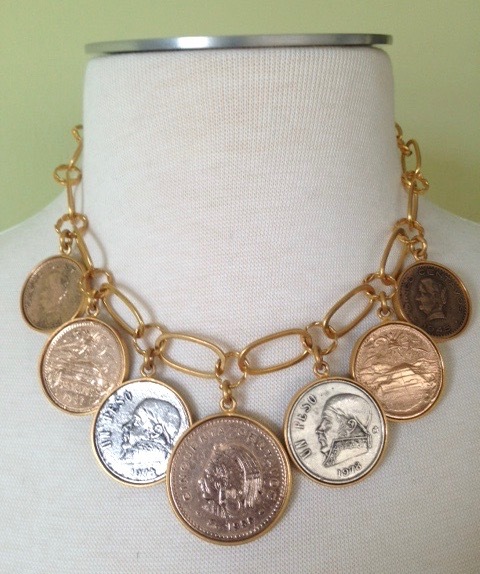 This necklace of old Mexican coins is one of my personal treasures. 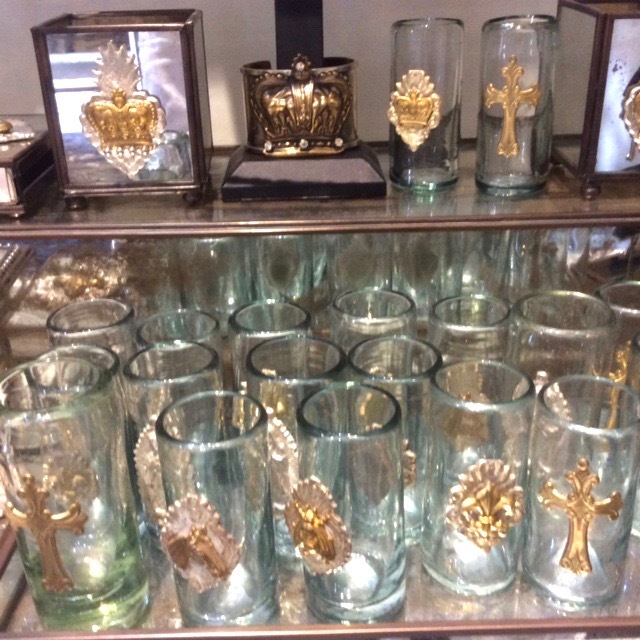 Katherine also carries vintage Mexican items, each rich with history. I have several of these glasses for sipping tequila in style. 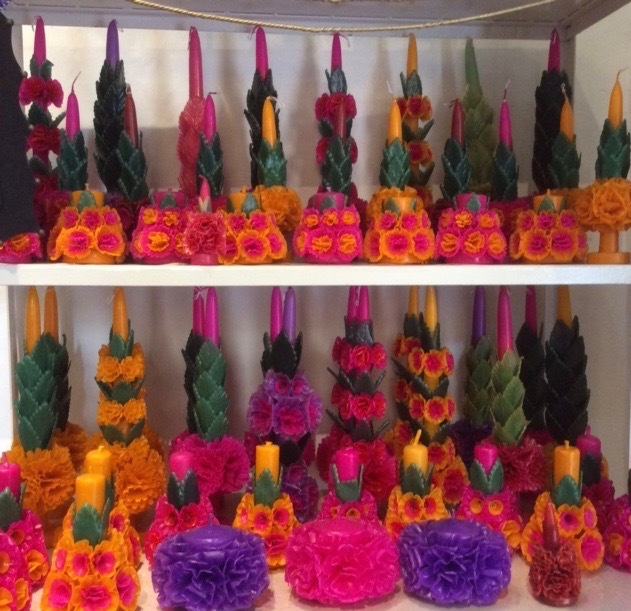 In addition to her own designs, Katherine has some traditional Mexican crafts like these gorgeous candles from Oaxaca. 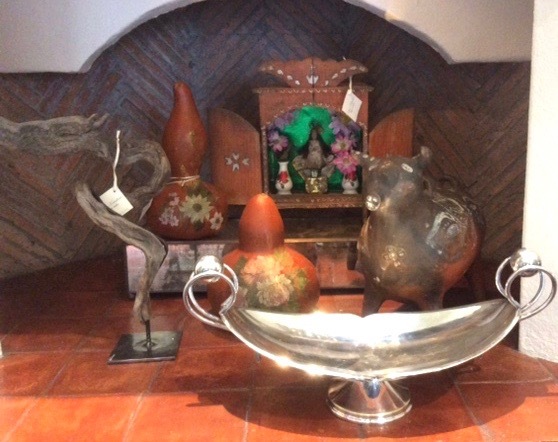 If you don't have a visit planned to San Miguel, many of the jewelry items are available at www.casakatalina.com.